admin on My Presentation and Nylon Fetish, Toronto Aqua Lounge, Feb 12th at 9:30 p.m.
Todd Smith on My Presentation and Nylon Fetish, Toronto Aqua Lounge, Feb 12th at 9:30 p.m.
Fantasy Stockings is a Canadian hosiery shop with a wide selection of pantyhose, stay up stockings, hold ups, garter belts, leggings, knee high socks, trouser socks, and other nylon legwear. We are based in Calgary, but have representation in Vancouver and Toronto too. Domestic shipping for Canada and United States. Discreet service available. I saw this online and I couldn’t resist but share with you! I think this is an excellent concept for coloured tights to have a smooth colour gradient. Personally I’ve seen tie-dyed tights before and I can’t stand anything that was coloured this way because it reminds me of some unfortunate laundry accidents rather than fashion. However, this concept is much neater, especially if it is styled nicely with the outfit. From my knowledge this product is from China and there is even a supplier on Alibaba website. Can Europeans brands try to repeat this? I’d be a big fan if I could find something of this sort from my favourite brands. Recently Victoria Secret was sued by their former hosiery supplier – Zephyrs. They stopped buying from them, but continued to use photos of their products on packaging of other hosiery that was of lower quality. The only thing that changed was that the label now read “made in Canada” rather than “made in Italy”. Zephyrs feels that Victoria Secret presented a Canadian knock off as if it was that high quality Italian brand that they originally worked with. This lawsuit was processed in Columbus, Ohio to claim false advertising and fraud. Maybe it’s a little off topic, but for me lately a lot of things were revolving around that city! I even ended up there in August – exactly the month when they had that case submitted. 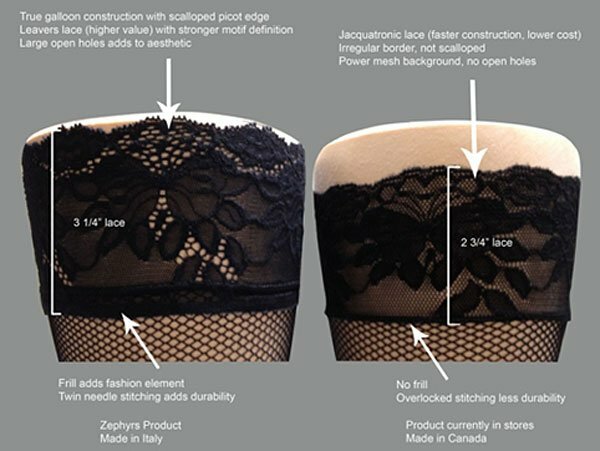 Styles that are being recalled are Lace Top Fish Net Stockings, Fish Net Thigh-Highs With Backseam, and Signature Stripe Thigh-High With Bows. If you ever tried those, I’d love to hear from you! Below you can see some images that show you the differences in the welt of the stockings.